The 10 Best Steakhouses in Florida! There’s no better meal than a big, juicy steak paired with your favorite hearty side dishes. The Sunshine State is home to some seriously good steakhouses with superior service and the best cuts of steak around. 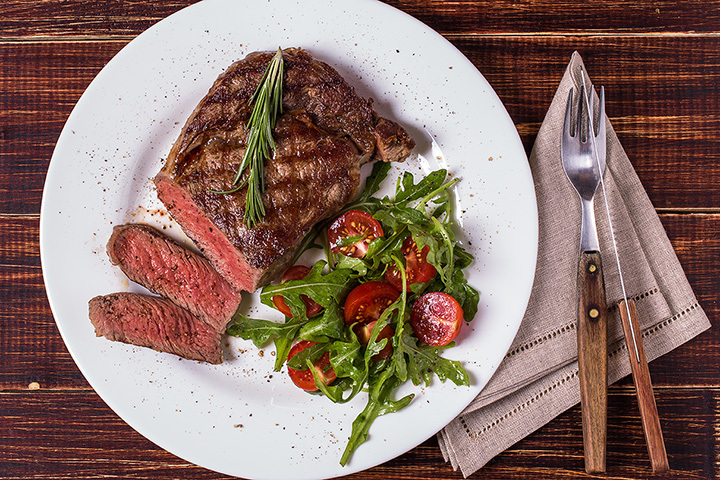 From sensational ribeye to fancy filets, our favorite steakhouses in Florida will satisfy your craving for a big slice of meat. With an entire menu dedicated only to steaks, you know Bern’s in Tampa means business. Choose your size, thickness, cut of your meat and temperature and you’re good to go—the expert chefs will take over from here! Afterwards make sure to head to the Dessert Room for a sweet specialty. Recognized by USA Today as Orlando’s “Best Steakhouse,” Kres Chophouse definitely lives up to the hype. This elegant steakhouse will have you feeling fancy as you cut into your house-aged chop and sipping on a handcrafted cocktail. Add a few sides to the table and you’re all set for a perfect meal! With over four decades of fine dining experience, Wolfgang’s Miami location knows what it takes to deliver an amazing steak dinner right to your plate. Make sure to give their yummy steakhouse a try! If you like a little entertainment while you dine, head to the Roadhouse Café in Fort Myers. Pairing great cuisine with live jazz music, this steakhouse is a good spot for a date night with that special someone. The steak au poivre New York strip will not disappoint! Another Orlando awarding-winning steakhouse has rightfully made our list and is a definite must-try. Just reading the words “36-ounce, 28-day dry-aged Tomahawk ribeye” off the Bull and Bear’s menu will make your mouth water, so why not give it a taste? Looking for a high quality chop in the Gainesville area? You should give Embers Wood Grill a shot! Hand-trimmed trimmed ribeye, surf-n-turf, porterhouses and more are waiting to be chosen off of Embers impressive menu. 1200 Chophouse’s name comes from the 1,200-degree broiler used to cook their in-house aged chops that are to die for. The Twin Filet Minon Oscar will satisfy your taste buds and melt in your mouth! If you find yourself in St. Pete head on over! Who doesn’t love the unlimited meats at Brazilian-style steakhouses? Each carving is delivered right to your table making a huge feast to enjoy. Don’t forget to save a little room for the sides and salad bar. Using only the best cuts of USDA prime beef, Christner’s in West Orlando is a great spot to celebrate something big! Each steak is cut to order, ensuring flavor and freshness. Pair your chop with one of the over 4,500 bottles of wine they have to choose from. Naples locals love their Jimmy P’s Charred steaks! The visible butcher shop lets guests see exactly how the chops for the night are prepared before being platted. Try the Butcher’s cut bone-in ribeye if you’re a true meat lover.